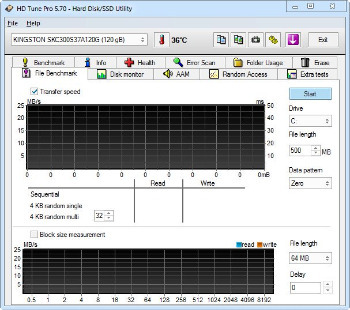 HD Tune Pro is a hard disk / SSD utility with many functions. It can be used to measure the drive’s performance, scan for errors, check the health status (S.M.A.R.T. ), securely erase all data and much more. HD Tune is a HD/SSD utility which contains various functions ranging from drive performance measurements to securely erasing all data. It is also capable of performing disk health checks (including scanning for errors and a temperature display). HD Tune Pro adds the following functionality compared to the free version: low-level write performance benchmark, file benchmark, random access performance measurement and a cache test. It also sports a disk monitor, a folder view (which displays the disk usage per folder) and the ability to manipulate the AAM (Automatic Acoustic Management) settings. HD Tune supports HDs (internal or external), SDDs, USB sticks, memory cards, iPods, etc. – The program has been designed to assess the performance of the storage devices and to offer details about the transfer rate capability. A full benchmark test can be run or just a verification of the transfer rate with a single file with custom size. – There are about ten types of tests that can be performed to receive information about the transfer rate including the random seek, the sequential mode and the burst rate test. – You can use the program to find out if your drive supports advanced features such as automatic acoustic management, 48-bit address or upgradeable firmware. All this information and more are available in just a few seconds without installing other complicated programs. – The program can keep you updated on the status of your hard drive in order to detect impending device failures or an accidental data loss. You can use the program to scan for damaged blocks and sectors periodically. All the errors are highlighted in order to prevent the problems that your hard drive might have. – If you want to know the folders that occupy most of the disk space, the program can provide you with a full report in just a few seconds by scanning the folder structure. Based on this information you can identify unnecessary files or folders and free the occupied disk space. – An interesting feature is the ability to reduce the noise of the hard drive by using an Automatic Acoustic Management (AAM) technique. If your device supports AAM the acoustic management parameters can be adjusted through this program. – The program is easy to use even by the casual user. It takes about 45 MB of RAM and during the error scan or the benchmark test it can use about 50% of the CPU time. It has an impact on the computer performance only during the tests and not while monitoring the hard drive and updating the disk information.